St. Patrick’s Day is here, which can mean a lot of celebrating, maybe with some corn beef and cabbage! But where to go? Here is a list of events you can attend that are on campus and off. Have fun and stay safe! 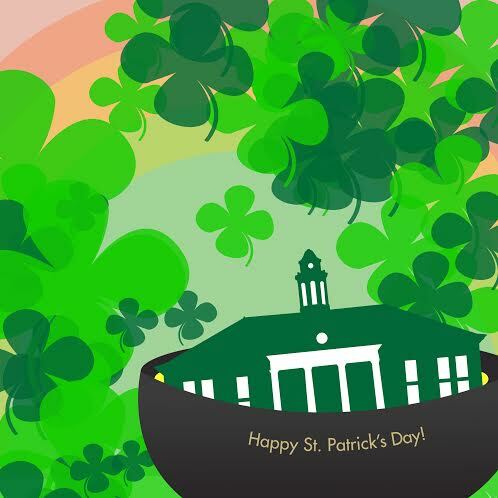 From 4:45 to 5:45 p.m., stop by the SSC to discuss leprechauns and shamrocks with the English Conversation club. Come to the Arboretum from 5 p.m. to 5:45 p.m. to hear a performance with highland pipes and a celtic fiddle. Bring lawn chairs and a picnic blanket! From 6 p.m. to 8:30 p.m., enjoy an Irish dinner and hear Dr. Amy Goodall speak about how citizen science and recent technologies support collecting data for birds and butterflies. You can pre-register online. Specials on Irish food and drink. All staff will be wearing kilts! Open from 10 a.m. to 5 p.m., get beers to-go for a special price. Sampling will be allowed. Hound Dog Hill and Shenandoah Alley, two appalachian bands, will be playing – no cover! With additional reporting by Kaitlyn Miller.